Are you familiar with MPR’s Three Minute Fiction? I was not until January 8, when I heard the announcement on Weekend All Things Considered of Round Six: Laughing and Crying. The premise is simple: a fictional story of 600 words, which, it turns out, actually takes closer to four minutes to read the story out loud. Each round has a different theme and this time the celebrity author/judge mandated that one character tell a joke and that another cry. I heard the MPR piece and the following story “Why?” sprang fully-formed into my head. It did’t win (the winning story will be broadcast this weekend); it didn’t even get selected as one of the weekly “Favorites”, of which there were 22. That wasn’t really much of a surprise since a) I haven’t written fiction since the 6th grade, b) my juvenilia is Crap! with a capital C; c) there were 4000 entries; and d) there were apparently a disproportionate number of stories about chickens. If I had won, though, I would have told Guy Raz all about how I wrote it (only during the minutes that my son Simon was not playing) at a hockey rink in a suburb called New Hope and how, on the way to the rink, I had to drive in the middle of the snowy road to avoid the African refugees walking, not on the sidewalks, but in the road just like I have seen so many people do on roads in West Africa. “Here’s a classic: Why did the chicken cross the road? Ever heard that one before?” He was a good man, a volunteer with the resettlement agency. He drove her to doctor appointments and to the Asian grocery store that sold palm butter. They sat across from each other at her kitchen table, drinking tea. He had helped her find this table at a secondhand store. He had brought her this blood-red teapot, had showed her how to use the gas stove. He was doing his best to help her understand America. Today he was teaching her American jokes. But those words…chicken ….road…brought her back to her village, back to that day. She looked down at her hands, folded politely in front of her. It was as if the months, the miles had evaporated. She saw it so clearly. Her little son and the chicken, in the road. Blessing loved that chicken – a small white hen, feisty and independent. Little Blessing loved that chicken and he worried about her, following her around much of the day as she scrabbled in the dirt. People in the village thought it was odd, laughed at the thought of treating an animal like it was more than something to eat. That was one of the things she had noticed that was different in America. That day, when they heard the trucks, they had all run inside to hide. The rebels had passed on the road many times before without stopping, but it was best to hide, to do nothing to draw their attention. That day in her village, she was on her knees on the dirt floor. It was the rainy season and there was water on the road. She heard the squeal of the brakes, the flat splash of water when the truck stopped. She squeezed her eyes shut and prayed harder. But Blessing, her little Blessing, saw his chicken crossing the road. He watched the truck stop. 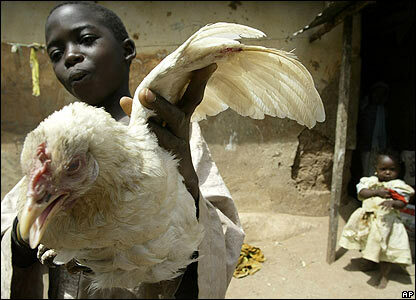 When one of the rebels grabbed his chicken, Blessing ran out of the house. It was a boy who did it. He was carrying a gun almost as big as himself. He could not have been more than a few years older than Blessing. In different times, he may have kicked a ball to him and laughed when Blessing ran after it on his chubby little legs. But this was a bad time. Everything had changed when the fighting began. The rebels took what they wanted, hurt who they wanted. That boy was carrying a gun almost as big as himself. And it was the young ones who were the most dangerous because they were unpredictable. She remembered everything else that had happened that day. The bullets that blazed her temple, her leg, her arm as she ran to Blessing. She remembered the women from her village who were raped, the men who were killed, the children who were taken to be porters and fighters. The rebels took all their animals, all their food; they burned all their buildings. She remembered her months in the refugee camp, her long journey to this strange, cold country. But she had built a wall inside around that part of herself since the moment when her little Blessing had crumpled to the ground. Until this moment, this unexpected American joke about the chicken and the road. She saw that her hands, balled into fists now, were glistening with wet. Another teardrop fell, rolling over her her knuckle, pulled inexorably down. She looked up and saw that he, too, had tears in his eyes. When I wrote this, I remember thinking that this story would also be an appropriate blog entry. I hoped to show with this story the connection between two people who outwardly don’t have much in common. He doesn’t know why she is crying, but still feels and bears witness to her pain. I also hoped to show that plenty of normal-seeming people are walking around with hidden scars, pain that is kept at bay, but only just and that might be suddenly triggered and result in a full-blown flashback. This story is fiction, but I have been in situations where something I said sent a human rights victim back into a bad time and place. Here is an example, if I gave you Coca Cola in a glass bottle, what would you think of? I think of the Coke machine in the basement of Audubon Hall on the LSU campus. When I visited my dad at his office, I was allowed to go down to the basement and put a quarter in the old-fashioned machine, open the door and retrieve an ice cold bottle. So for me, a bottle of Coca Cola has entirely positive connotations. But I had a client once who was tortured with an empty glass Coke bottle. For her, the thought or sight of a glass bottle could cause her to panic. It’s scary when someone suddenly begins to disassociate. And like the guy in this story, you feel guilty when something you do triggers it. Ideas for stories (some realistic fiction like this and some not) spring into my head all the time, but I the reason that I took the time to write this one down – in that ice arena in New Hope, MN – was because I think more people need to be aware that many of us (not just refugees) are carrying a heavy burden of memories from a painful time. More of us should be on the lookout for how we can make that human connection. It won’t change the world, but it might just help make it a little bit better. You nailed it, Jenni. Takk for at du skriver!